Photo: Once an orphan with little hope, Mary has come through our program and now has a degree that qualifies her to return to her native village to become a school teacher. She wants to offer other children who are in her former circumstances the hope that she’s been given. We are very happy to share an uplifting story of one of our orphans, 19-year-old Mary, who has grown up at one of our orphan homes in Myanmar, living a happy life full of hope. When she was 2 years old, her father died in a car accident. Mary’s mother was not able to support her nor provide the things she needed for school. Her mother was distraught and waited and waited for help. Then one day, her mother heard about our orphan homes and sent Mary to us, and now she has been living with us in a safe and nurturing environment for 6 years. Since she arrived at the home, Mary has always worked hard in school, she has been an obedient student, and faithful to her studies. She graduated from high school this year; her favorite subject was history. Now she is seeking to become a school teacher back in her native village. She wants to offer other children who are in her former circumstances the hope that she’s been given. This is exactly the ‘cycle of hope’ we aim to create with our children— empowering them to be the agents of change and hope our world so desperately needs. She has turned in her application to pursue this profession; in Myanmar a high school degree with good marks is enough to qualify as a village school teacher. 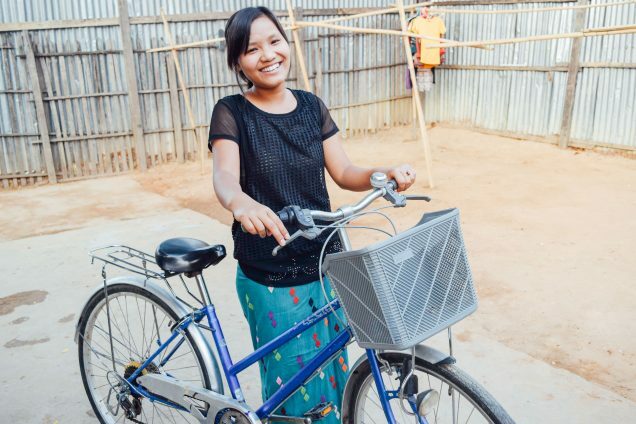 By the end of May she will know whether or not the government will recognize her as an official school teacher in her village. She also enjoys playing the guitar and singing, and she reports that she is so happy that everything has changed in her life, and she thanks God and those who are praying for her life. 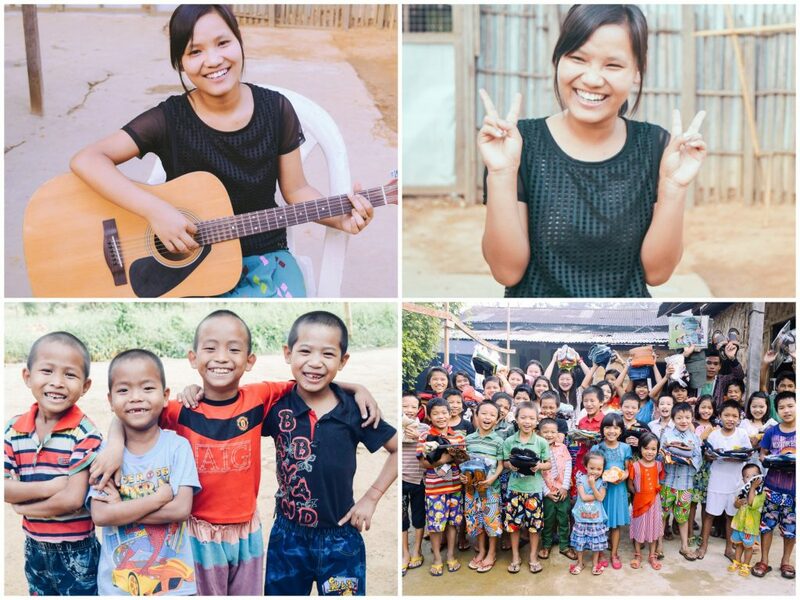 Photo inset: (Top-left): Mary learned to play guitar while growing up at our Myanmar orphan home. (Top-right): Mary is happy and thankful for the new life she was given through our Myanmar orphan home. (Bottom-left): These boys at one of our Myanmar orphan homes are grateful for their loving home and family. (Bottom-right): Children from our Myanmar orphan homes excitedly show the new clothes they recently received. We are grateful for success stories such as Mary’s. These stories offer hope in stark contrast to the damaging results of extreme poverty and disease in South Asia, which has left millions of children orphaned and often falling victim to child prostitution, human trafficking, or forced labor. Peace Gospel’s orphan homes in Myanmar act as safe havens in the midst of these dark circumstances, offering orphans a way out of the hopelessness of poverty and hunger. Through the work of our organization, these children are provided a loving home centered on the biblical principals of God’s love for them. In other news from our Myanmar programs, we are trying to solve a problem at our piggery: our Buddhist neighbors have built a new pagoda and are not allowing a piggery near their place of worship. Out of respect for their desires and our wish to maintain peaceful relations with our neighbors, we have plans to dismantle our old piggery structure and build a home rental property on the same plot. We would like to begin the construction as soon as possible, expecting to complete the new home in April. With your support, we hope to raise $9,500 which would enable our faithful native team to charge $225 in monthly rent, providing them a funding generator of $2,700 annually. The investment would pay for itself in just 3.5 years. This additional funding generator will be added to our list of other small business enterprise operations: a preschool scheduled to open in June or July, our 12-acre farmland enterprise consisting of a rice paddy farm and a garden where we cultivate organic, nutritious ingredients for the children’s meals. We also desire to raise hens for egg production because they will be a beneficial addition to our farmland enterprise, and provide a good profit at market. To round out the good news, this week all of the children finished their final exams at school, and we are planning to take them to the park for a picnic and give them special, delicious food to celebrate. One can only imagine the exponential ripple effect these children will make in the world as they eventually graduate and go on to lead successful, productive lives.